On October 4, 2018, Mr. Kamal Najem, Head of the Egyptian Customs Authority, received Dr. Mamdouh El Refaie, President of the Arab Customs Union and his accompanying delegation in his office at the Customs. this is in the framework of the cooperation agreement signed between the union and the Egyptian Customs Authority. The meeting was started by Mr. Najem and his accompanying delegation. 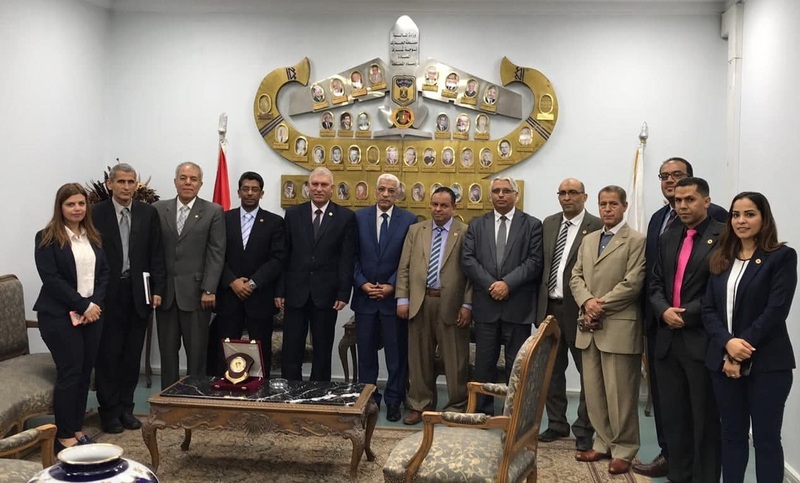 The head of the Egyptian Customs stressed his respect to all the gentlemen of the customs and that they represent an important part of the customs system and considered as main partners cannot be dispensed for the purpose of the customs work. Dr. Mamdouh Rifai, President of the Arab Customs Union, began his speech by thanking Mr. Najem and the officials of the Egyptian Customs Authority for their hospitality and presented a congratulatory speech to His Excellency on the occasion of the glorious October Victory. Dr. Mamdouh Rifai said that there are responsibilities and duties of the trustee towards the Customs, one of which is the good dealing between the trustee and the customs officer, and the presence of the detection. inspection and evaluation of the dispatch, in addition, his responsibility is ended at the door of the customs port, as well as paying attention to the laws, regulations and decisions issued and the latest developments. Al-Rifai pointed out that the Union will provide social and health services through establishment of a Takaful Fund and a health insurance system for associate members to provide health care to all the Union's trustees and to serve the Arab customs trustee. The participants then discussed the responsibilities and duties of the Arab customs trustee in accordance with the laws related to Egyptian Customs, the program and the proposal submitted by the Arab Union Customs to combat customs evasion, commercial fraud and parallel economy through the establishment of conferences, workshops, film materials, social networking sites and the media. The electronic portal of the Arab Customs Union, which publishes and exchanges customs information and all information of interest to its members, was also discussed. The Arab Union presented a proposal to train customs trustee to quality them, especially that the Egyptian Customs has qualified in all customs fields and accordingly, the Egyptian Customs Authority has agreed upon the training under coordination with the Union to determine the required training materials and programs. The union officials asked that the members of the union receive priority and privilege in Egyptian customs departments and ports in accordance with the agreement signed with the Customs Authority. It was agreed that the trustees bearing the union card would be included in the approved program (the appointed economic actor) and that the representative of the legal union would attend the investigation of customs violations made under the attendance of the with the union trustee who will be a member of the disciplinary body that investigates with the customs trustee. In addition, in case the licensee reaches the pension age (70 years), the union’s proposes to inherit the license and the office owner is eligible for voluntary retirement, while applying all the required conditions at the Customs Authority and attending repeated courses in order to grant the office for others. Mr. Najem commented on this proposal that customs have no objection to the inheritance of the customs license, as long as the reputation of the trustee allows him to do so, pointing out that this is a great step for the Union to provide sincere and competent trustee in the field of customs clearance and preserve the history of the trustee. The meeting was attended by Mr. Samir Abu El-Nasr, former Secretary-General of the union, Mr. Mohamed Hamada, Assistant Secretary-General, Ms. Rana El Gammal, Director of the Office of the Union President, Ms. Mariana Mahfouz, Director of the Union's Media Sector, and Mr. Omar Sadat, who is responsible for the trustee affairs. From the Egyptian Customs Authority, the meeting was also attended by Dr. Ahmed Sobeih, Head of the Central Department of Public Relations and Communications, Mr. Hilal Tawfiq, Head of the Central Air Export Administration, Mr. Ahmed Shehata, General Manager of the Technical Office, Mr. Atef Ibrahim, Director General of Internal Communications and Media Advisor and Mona Anwar, head of the communication general directorate section.